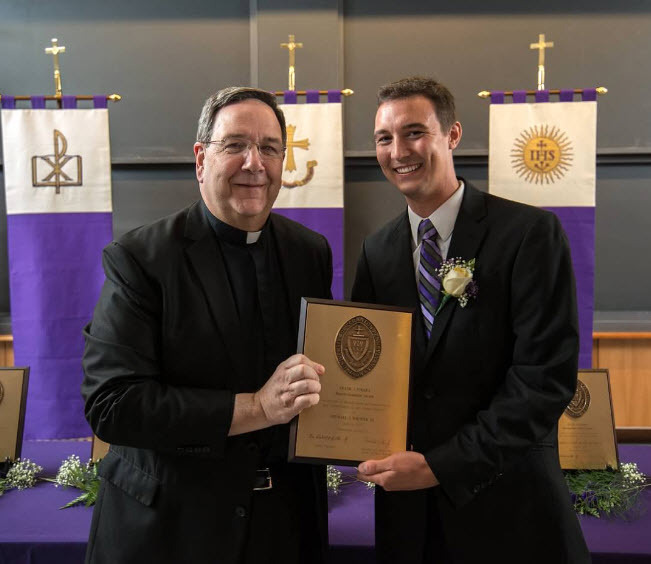 The University of Scranton in Scranton, PA honored Michael Wiencek, principal of Yap Catholic High School, with the Frank J. O’Hara Recent Graduate Award at the university's annual O’Hara Celebration during Alumni Weekend on June 9. The Frank J. O'Hara Distinguished Alumni Award is the highest award bestowed jointly by the University and The Alumni Society. This award honors select alumni who embody Scranton's Catholic and Jesuit experience and who have achieved distinction in their professional or personal endeavors. Honorees are selected based on the nominees' commitment to Ignatian values and their pursuit of professional and personal excellence. The Frank J. O'Hara Recent Graduate Award presented to Wiencek is given to an alumnus/a who has graduated within the past ten years. The recipient will have demonstrated an outstanding commitment to service for others in their personal or professional achievements, which embody Scranton's Catholic and Jesuit values. Wiencek now enters his fifth year at Yap Catholic High School after joining the faculty as part of the volunteer teacher program. The 2017-2018 school year will be his second year serving as principal.